« Giliap » tente de montrer un état d’esprit et des conditions de vie qui, à mon avis, prévalent aujourd’hui comme par le passé. On pourrait le considérer comme un appel muet à la confiance, à la communication, à la connaissance sous une forme qui essaie de repoétiser le langage cinématographique par un rapprochement de la pensée et de la sensibilité. Roy Andersson was born in Gothenburg, Sweden in 1943. A year after graduating from the Swedish Film Institute in 1969, he directed his first feature-length film, « A Swedish Love Story ». The film, awarded four prizes the same year at the International Film Festival in Berlin, looked at the nature and nuance of young love and turned out to be a major critical and popular success for Andersson. As he didn’t want to get stuck with the same style and expectations he cancelled what was going to be his next project, with the script half-way finished, and skipped a couple of other ideas for plots he had previously planned to realize. Eventually he directed the film « Giliap » which was released in 1975. The film was not a financial and critical success. 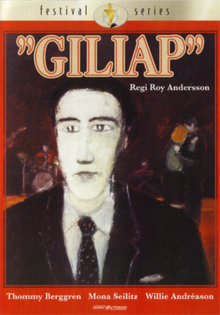 After « Giliap », Andersson would take a 25-year break from film directing.